The Fiat 500 is the ultimate city car. Retro in style with economical performance and value for money to match. Small in size but big in stature. This 3 door version was designed for the fast pace of the city in mind. It comes in diesel or petrol versions. The most economical is the 1.3 MultiJet 95HP version which returns up to 94.2mpg. The fastest in terms of 0-62mph is the 0.9 TwinAir 105HP which can go from 0-62mph in just 10 seconds. Each version has that small car feel in terms of handling. 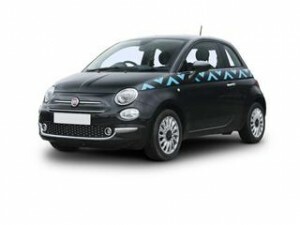 Bright colours and a funky design compliment the Fiat 500’s interior perfectly. With a gentle nudge to the 50’s yet still housing all the modern technology you would expect. The Lounge version comes with a panoramic sunroof to give a sense of openness to the cabin. Glossy plastic is featured throughout and the recently updated infotainment screen is a welcome update. Boot space is 185 litres which for the 500’s size is very clever. The back seats fold down too to further improve the space to 550 litres. Don’t pay full dealer list prices for your new Fiat 500. You could make significant savings by using Coast2Coast Cars to source your new Fiat. Don’t waste your time driving from dealer to dealer and searching hours online to find the best price for your new. Our new car quotation service to all of this for you at no cost. Our database of dealers and franchise owners continuously keepers updated with their latest offers and money-saving deals on new cars. The savings are passed on directly to you. To find out how much your new Fiat 500 could cost and what savings you could make simply fill in the online form now. No fuss and no fees.